Every Language . 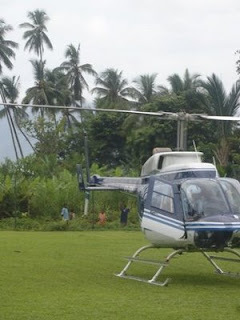 . .: helicopter! 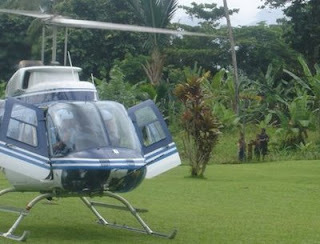 The day before I left Alotau (after the close of VITAL) to return to Ukarumpa we had a really cool happening…a helicopter landed in our “back yard”. 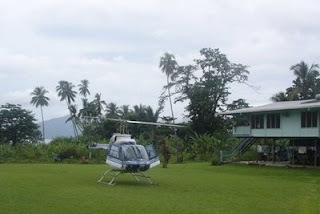 The helicopter had gone to Fergusson Island (smallish island off the southeastern coast of PNG) to pick up a couple doing translation out there. They overnighted at the Alotau Regional Center, so the best place to park was in the big grassy area out back. The clothes on the clothesline under the house got a great deal of wind during takeoff...some even ended up blowing off the line and to the far side of the house! I missed the landing, but it was really cool to be able to watch them take off the next morning…and a bunch of our neighbor kids thought so too!